It’s still a full month before Halloween yet one resident appears to have been so excited about the occasion that she started decorating her North Dakota home in hyper-realistic, horror movie fashion. The homeowner hung a Halloween decoration in the window of her home that neighbors found so scary it prompted one well-meaning resident to ask for police assistance to check on the house. 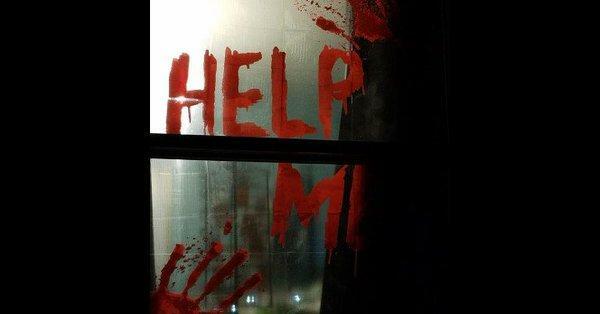 The sign on the window had the message “Help Me” which was easily mistaken as written in blood. But no one in the house is in need of any dire help as it’s just part of Becky Muhs’ display in her West Fargo home for her favorite holiday. Muhs told the local media that shortly after putting up the Halloween decoration, she and her husband started getting frantic calls from neighbors checking on them if they were okay. One concerned neighbor went so far as to call 911 for assistance, presumably thinking that someone in the house was in need of rescue. The call led to one police officer paying Muhs home a visit. Muhs said, however, that everything was chill as soon as the officer found out it was just a harmless Halloween decoration. She shared how their little chat even ended in laughs. In the end, the officer didn’t even ask her to take down the sign. Some social media users, however, did not find the sign funny, while others had a laugh and one even said it is some material for a horror film.